My friend Joanne is an avid sprouter and raw foodist who has always encouraged me to sprout my own grains. Alas, after a few failed attempts I admit I was a bit discouraged from trying again -- but I did and it worked! Sprouting seeds, grains, beans and lentils has fantastic health benefits and helps add live food to our diet, especially during the winter when the only fresh food available is imported from hundreds of miles away. Once sprouted, however, you can eat them raw or cooked. See below for ideas of how to use sprouts! Pick over the beans and lentils removing blackened or split ones. Wash thoroughly, then soak in a jar filled with water. Soak 8 hours (away from of direct light) or overnight, then wash again, strain, and place back in the jar. Cover the opening with the cloth, held in place with the rubber band, and rest on its side but with the bottom slightly tilted to help drain the excess water. Repeat the cycle of rinsing, draining and resting on a tilt 3 times in the day and overnight again (this keeps the beans moist). The next morning you should have a jar of sprouts! If not, repeat the rinse cycle until sprouted (maybe 1 more day). The sprouts are ready when the tails are about the length of the beans themselves. Rinse and drain once more before storing refrigerated; consume within a few days. Get lots more information just Googling "how to sprout grains" or check out this Living Foods website. Ayurveda considers sprouted grains, beans and seeds sattvic, the healthiest kind of food. 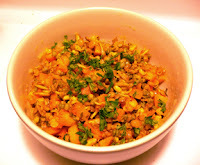 Pictured here in a highly digestible quick saute in ghee with diced carrots, fresh garlic and ginger, and powdered turmeric, coriander and cumin with a pinch of sea salt and dusting of minced parsley. Always wanted to try sprouting - but was discouraged by reading something about a possible build-up of toxins if the sprouting conditions aren't absolutely hygienic (or if the sprouts aren't rinsed sufficiently). Still, it's a lot cheaper and more efficient than buying plastic-packaged already sprouted shoots from the supermarket. Sprouting beans sounds interesting. I will have to try it. I've been sprouting alfa alfa, as it was recommended to me by my ayurveda specialist to eat a cup of alfa alfa sprouts everyday. But I didn't know that toxins can build up in sprouts.How can I avoid that? Why is it that Ayurveda is being completely destroyed by the blending of western diet and nutrition all the time. 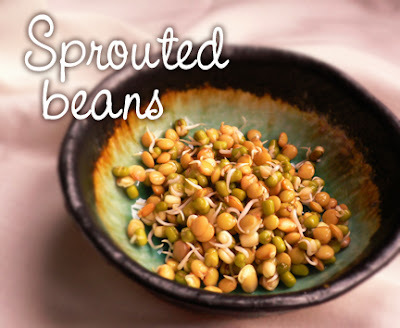 Sprouts are abhishandi, excess moisture producing and not good for consumption. Look at the real Ayurvedic texts please not new age one. I don't know about toxins but I do know that it's easy for bacteria to grow on sprouts during the sprouting process. Rinsing thoroughly at each stage is really important to prevent this!